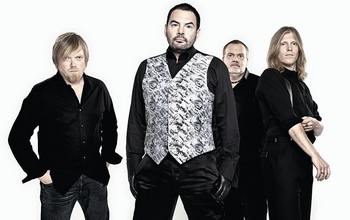 German synth pop group Alphaville enjoyed major success in the United States with their early hits ”Forever Young” and ”Big in Japan,” and went on to a lasting career in Europe, South America, and Asia. Alphaville were formed by vocalist and lyricist Marian Gold and keyboard player Bernhard Lloyd, both of whom were members of the Nelson Community, a multimedia art collective based in Berlin. Gold and Lloyd were part of a short-lived band called Chinchilla Green (other members went on to form the groups Melody Nelson and Girl Next Door), and when Lloyd began putting together a new act with fellow keyboardist Frank Mertens in 1982, they invited Gold to be their lead singer. Originally known as Forever Young, the band borrowed the name Alphaville from the acclaimed 1965 film by Jean-Luc Godard. In 1983, Alphaville landed an international record deal with WEA, and the following year they released their debut single, ”Big in Japan.” The song soon became a major worldwide hit, and Alphaville’s first album, Forever Young, quickly followed. Despite Alphaville’s sudden success, Frank Mertens opted to leave the band by the end of 1984, and the group added former Chinchilla Green member Ricky Echolette on guitar and keyboards. In 1986, Alphaville released their second album, Afternoons in Utopia, which introduced a more lush and ambitious sound for the trio, with dozens of studio musicians contributing to the project, and for their third LP, The Breathtaking Blue, the trio collaborated with producer Klaus Schulze, a former member of Tangerine Dream and Ash Ra Tempel. The group invited several noted filmmakers to create videos for each of the album’s nine songs, which were released under the collective title Songlines; one of the videos, Balance, went on to win the 1990 Academy Award for Best Animated Short Subject.